I’m feeling really indecisive about both matches… thoughts on Kerber-Kvitova HERE where I think (but I keep changing my mind haha) that i’m going for Kvitova. In the second semi-final, i’ve got this weird feeling that Siegemund might come through against Radwanska. She’s played some wonderful tennis this week, above and beyond anything she’s produced prior to Stuttgart, and I feel like it might continue if she doesn’t overthink the situation. She thrives on the home support and is so, so gutsy. Yeah, i’ll take a risk and go for Siegemund to continue her dream week. Vinci d. Siegemund in 3 sets – This could be an awesome match! Both have different styles and if they play aggressively on this surface, could all come together. Siegemund has been fantastic this week but will be playing her sixth match. I keep underestimating Vinci… I read too much into her results at the weekend in Fed Cup. Radwanska d. Pliskova in 2 sets – The head-to-head (5-0 in matches and 10-0 in sets) speaks for itself. While Pliskova’s serve will be maximised on this surface, I think Radwanska will be more than capable of exploiting Pliskova’s injury. Goerges d. Vinci in 3 sets – Honestly, I like Roberta… I seem to go against her all the time! She proves me wrong almost always. Just leaning towards Goerges though in this one with how well she plays on this surface. Radwanska d. Petkovic in 3 sets – Fancy Petkovic to do well in this match but copped out of going for the upset with the H2H so heavily in Radwanska’s favour at 6-0. 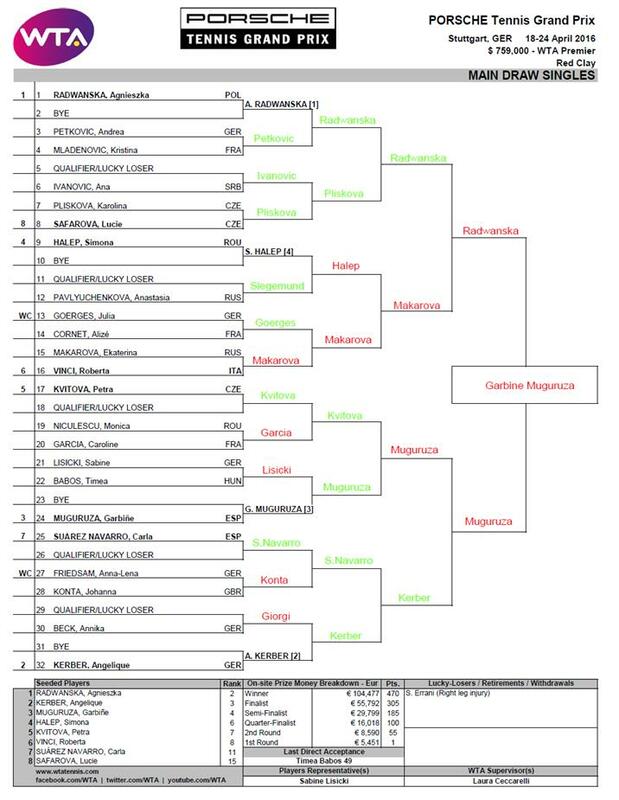 I think Aga will be vulnerable early on in her first clay court match. My hunch is that it could be a super entertaining match. Remember their Beijing final?! For Halep-Siegemund and Ivanovic-Pliskova, i’m on the fence with both as Halep and Pliskova have injuries. Kerber d. Beck in 2 sets – Great win for Beck over Giorgi, but don’t anticipate too many issues for Kerber whp has looked/sounded relaxed in press. Muguruza d. Babos in 2 sets – Babos has the confidence from her R1 win over Lisicki but felt good pre-draw about Muguruza’s chances this week. She knows what she needs to do after producing a superb display to defeat an in-form Babos in Doha earlier this year. Makarova d. Vinci in 2 sets – Vinci really struggled in Fed Cup action at the weekend so i’m intrigued to see how this one pans out. Head-to-head is pretty close with Makarova leading 3-2, but feel she will have the edge in this one. Garcia d. Niculescu in 3 sets – This could be a wacky one! I’d guess this is a good surface for Garcia and would otherwise have gone for Niculescu. Confidence from Fed Cup may help CarGar too, as well as possibly going against Niculescu who missed match points in a loss to Petkovic. Kvitova d. Chirico in 3 sets – Very interesting match, i’ve been impressed with Chirico and she seems to be playing much better after a slow start to the year due to an ankle injury. Kvitova will always be Kvitova, but i’d fancy her to just edge it. Giorgi d. Beck in 2 sets – The lucky losers normally come good so I quite like Giorgi in this match-up. Beck will have the home support but I doubt this will deter Giorgi. Siegemund d. Pavlyuchenkova in 3 sets – Two minds with this one… I could have seen Pavs snapping out of her current predicament as we’re indoors (Peak Pavs) and she’s actually decent on clay. Siegemund though is a gutsy competitor and will be high on confidence following a run to the quarters in Charleston and three wins in qualifying to get used to the surface. Ivanovic d. Witthoeft in 3 sets – Fancy a couple of close sets, wouldn’t be surprised if Witthoeft won a set. Since I watched the German player against Falconi in IW (a match that made my eyes hurt), she’s obviously picked up her performances in a big way. I think the German player will be dangerous but i’d be surprised if Ivanovic doesn’t get the win at the end of the day. Suárez Navarro d. Dodin in 2 sets – Intrigued by this one, Dodin is a huge hitter and will be capable of unsettling CSN. If the Spaniard can maintain her position on the baseline and keep up her intensity then she should be too strong. Looking forward to watching some of Dodin though as i’ve seen very little of her play before. Konta d. Friedsam in 2 sets – First match of the tournament should be an interesting one! I was so impressed by Konta in Miami, but clay offers a new challenge. As a pretty decent server, the surface should suit her game. Friedsam has had an excellent year so far and is a very dynamic player, but going for Konta in straights. Lisicki d. Babos in 3 sets – Hmmm, this one will likely be close if Lisicki can get off to a good start… Preview HERE.